Today many people put most of their personal, private information on a computer and most think that it is safe there because it is protected by their own personal password but is it? Unfortunately, even if you have adequate protection against hacking, it may not be. When you are on your computer, especially on a laptop somewhere where you are unfamiliar with, anyone could be looking over your shoulder and notice the password you put in to access any of your information. Of course, once they have knowledge of your password they can access your information as and when they are ready to and your privacy has been breached, perhaps leading to your identity being stolen. Today there is an ever-increasing number of identity thefts taking place and not only that but the thieves are getting smarter, learning more ways to thief an identity and how to get away with it. The identity thief today may steal your information one day but now, like the bank robber that stashed their ill-gotten a for months, perhaps even years before using in order to avoid capture, they store your information for an opportune moment to use it, one when you will have no idea as to when or where the information had been stolen. By doing this, delaying action for long periods, the identity thief has less chance of being caught and so has become more brazen in their methods of stealing the information, making all of us more at risk of having our identity stolen than ever before. One of the problems we face is the fact that light travels in straight lines but can also be seen from several angles, including the light from the screens of our laptops or PCs. This means that someone sat next to you on an airplane, train or bus can see what is on your screen anytime you are using your laptop. It also means that someone that shares your office may be able to see what is on your PC. There is, however, a way to avoid them from being able to and that is by using a Privacy Filter on your screen. 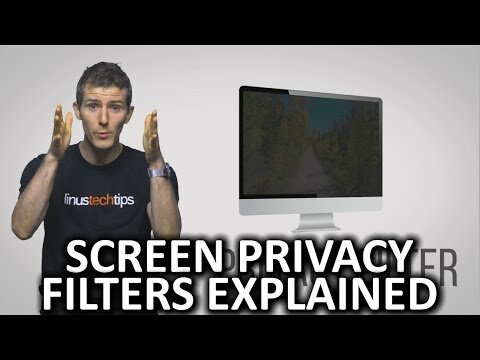 These are filters which, when attached either temporarily or permanently to the screen of your PC or laptop, greatly reduce the angle at which the light from the screens can travel, making it virtually impossible for anyone to see what is on your screen unless they are actually, physically looking from over your shoulder. Although the first of these screens was probably developed by 3M, today many different companies make them which mean that you can now get a privacy filter for almost any brand or size of PC, laptop or most of the handheld devices available today. We should of course still take precautions when entering our private details into our devices but at least by using a filter, anyone stealing that information would have to be sat exactly where you are.